Pack includes a backpack, limited edition long-sleeved shirt, and a signature silver Super Soccer Stars ball. 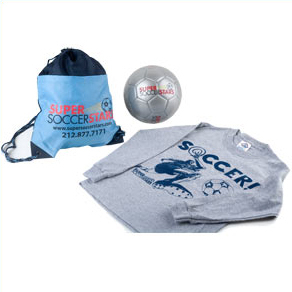 Pack includes a backpack, wool hat, scarf, hoodie, and signature silver Super Soccer Stars ball. 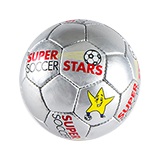 Official Super Soccer Stars Size 3 Soccer Ball. This online procedure is intended to speed up and facilitate the application process. However, the class you are applying to may be full at the time you are filling out this request, or by the time your request is processed. Once your spot in your selected class is verified, Confirmation of Enrollment will be sent to the email address with which you have provided us. Stars Premier Enrollment ONLY: Stars Premier class enrollment is subject to Premier Approval and availability. For Players who are not Premier Approved, Enrollment is subject to Player Evaluation in the selected Stars Premier class. Players will be added to the class for the remainder of the season following a successful Player Evaluation. In the event of an unsuccessful Player Evaluation, Stars Premier Administrators will assist with identifying an appropriate Super Soccer Stars class option. If your player is already Premier Approved your Stars Premier Enrollment will be confirmed subject to availability in the class. I am the parent/guardian I certify that my child has no known medical or other conditions that could interfere with his/her participation in Stars Premier activities. I also understand and accept that the practice of soccer, both indoor and outdoor, involves certain risks of physical injury. Therefore, I, individually and on behalf of my child listed above, hereby release, discharge, and hold harmless Round Star, Inc. d/b/a Stars Premier and each of its respective parent, subsidiary, and affiliated companies, and each of their respective officers, directors, agents, representatives, employees, successors, assignees, and licensees (hereinafter, "the Released Parties") from any and all claims, actions, damages, losses, liabilities, costs and expenses of any kind whatsoever, including but not limited to any claims of negligence, arising out of, resulting from, by reason of, or in connection with my child's participation in any Stars Premier program or activity. I agree that I will not bring or be a party to any legal action or claim against the Released Parties, or any of them, based upon or arising out of my child's participation in any Stars Premier program or activity on any legal theory whatsoever (including without limitation personal injury, negligence, rights of privacy and publicity, or defamation). I understand and agree that Stars Premier has the right to terminate the enrollment of any child from Stars Premier if it, in its sole discretion, determines that the continued attendance of the child in the program is not in the best interest of the child or the program. I agree to supervise or designate a responsible adult to supervise my child prior to and immediately after his/her Stars Premier activities. I understand and agree that in case of an allergic reaction, I am solely responsible for attending to and treating my child. Stars Premier coaches are not authorized to administer medication or EpiPens. Stars Premier and its agents reserve the right to take and utilize photographs, videos, or any type of recordings of participating children and their parents, caregivers, or anyone accompanying them to Stars Premier while engaged in our classes or associated activities. I consent to Stars Premier's use of the photographs, videos, or recordings of my child, me, or the guardian I have designated for advertising, promotional, or related purposes, and waive all rights to compensation and other rights which may arise as a result (including any rights under N.Y. Civil Rights Law 50). I understand and agree that the email address(es) I have provided herein will be added to the distribution list for Super Soccer Stars Premier and its affiliates. Stars Premier guarantees a full prorated refund (minus a $35 administrative fee) for the session�s remaining classes before the fourth class of any period. No refunds thereafter. In the event that you decide to withdraw your child from the program, you must notify the Stars Premier office no less than 24 hours before the fourth class of the pertinent period, and are responsible for all charges until you do so. No refunds for missed classes. Two free make-up classes are permitted, contingent upon availability in a class within your child�s corresponding age category and upon express and specific consent of Stars Premier management. Additional make-ups are available for a fee of $40 per make-up. All make-ups must be scheduled and canceled no less than 24 hours before the scheduled start time. All make-ups must be used before the end of the current semester; under no circumstances do make-ups carry over to any other Stars Premier session. No make-ups may be scheduled the first or last week of a session. We reserve the right to cancel classes due to low enrollment. All checks must be made payable to Super Soccer Stars for the full amount of the session�s fee, and mailed to 606 Columbus Ave, NY, NY 10024. Your child's spot will not be confirmed in the class until payment and application are received at the Stars Premier office listed above. In the event of a bounced check or insufficient funds a service fee of $25 will be incurred. Absolutely no toys or snacks out of their containers during class. Children who wear glasses must use shatterproof eyewear at all times. Players MUST wear shin guards and soccer appropriate footwear or sneakers otherwise they will not be allowed to participate in class. Sweatpants or shorts are recommended. Stars Premier is not responsible for personal belongings; please keep your items with you at all times. Soccer balls are also available ($15 each). All administrative questions must be referred to the Stars Premier office (212 877 7771), not to the coaches. Your questions or comments are always welcome. Feel free to contact us via telephone, fax, or email at any time. I ACKNOWLEDGE I HAVE READ AND I ACCEPT ALL ENROLLMENT CONDITIONS.